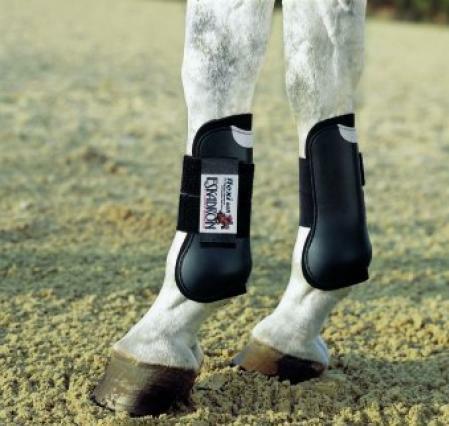 Eskadron Flexisoft tendon boots - fantastic fit and protection. Flexisoft boots are available in a great range of colours including chocolate, green, grey, blue, white, bordeaux, cognac and black. 5 stars Fabulous fit and protection! 5 stars This is the second pair we have purchased from this company. Excellent service received and they boots are extremely hard wearing and a great fit. Many thanks. 5 stars The product came very fast! I am in the US and it was just as fast as here! These boots are still my favorite as far as durability and protection! 5 stars Well fitted, with a nice stretch to them and the colours are bright, overall, good everyday jumping boots. 5 stars Excellent service. Eskadron boots are wonderful used them for a few years and product very well made. Website easy to navigate and ordering all efficient and a 5 star service was provided. Definately shop from this site again. Many Thanks. Ann Porter. Wiltshire. Flexisoft the Material: Eskadron's Flexisoft boots are made with a highly complex two-component injection moulding die; and the special shape around the ergot gives the boots vastly superior fit and comfort.